Every morning Tim starts his day with the same prayer, “Lord, break my heart with the things that break your heart, help me to see people and circumstances the way you see them, and teach me how to be a man 100% sold out to you.” This prayer has been the guiding principle of Tim’s life since he committed his life to Christ over 40 years ago. With degrees in Communications, Religious Studies, and Social Science, without planning for it, Tim was destined to serve the Lord in ministry. Tim began a ministry in broadcasting in 1976 when as a teenager he began working in Christian radio. In 1980 Tim began his ministry in television when he served as an intern at WPCB TV 40. 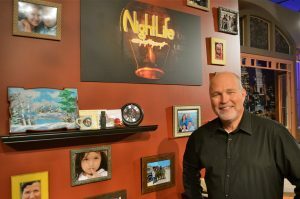 Feeling personally called by God to help disciple and equip people to change their world for Jesus’ sake, Tim has ministered around the globe through crusades, seminars, street evangelism, tent meetings, television, radio, and the Internet. Tim has used whatever means of communication he could to present Jesus in a way that anyone would be able to understand. His travels have taken him to some of the most dangerous and challenging places; from Iraq to the streets of New York City, from the Siberian plain to Sudan, traveling to over 95 countries. He and his wife Paige have been part of the Christian Center Church Family since 1984 where Tim now serves as the Lead Pastor. Tim’s heart is to see everyone become who God has called him or her to be; that every person’s gifts would be grown and used and every person’s purpose fulfilled. In his heart, that is the best way to change the world! Tim and Paige have a daughter, Amanda and a son Christopher and Daughter-in-law, Rachel.